Many drugs and natural products around us contain benzimidazole scaffolds, for example, albendazole (Albenza, GlaxoSmithKline) and tiabendazole (Mintezol, Merck & Co.), and quinazolinone ones, for instance, febrifugine and halofuginone. Michael Willis and co-workers at the University of Oxford in a collaboration with Pfizer have developed a microwave-assisted palladium-catalyzed benzimidazole synthesis with carboximidoyl chlorides and amines as substrates. (See the scheme above.) The reaction condition involved 5 mol% palladium(II) acetate as the precatalyst, 7 mol% Ad2Pn-Bu, also known as cataCXium A, as the ligand, and sodium tert-butoxide as the base in trifluorotoluene as the solvent. The procedure tolerated a wide range of substituents, but aromatic amines rendered benzimidazoles in more moderate yields. Carboximidates could replace the carboximidoyl chlorides although a higher reaction temperature and a longer reaction time were necessary and only anilines could be applied. The method still permited diverse functional groups. The reaction mechanism begins with nucleophilic substitution by the amine at the carboximidoyl or carboximidate carbon to give the corresponding imidine as the reaction intermediate, followed by intramolecular palladium-catalyzed amination. 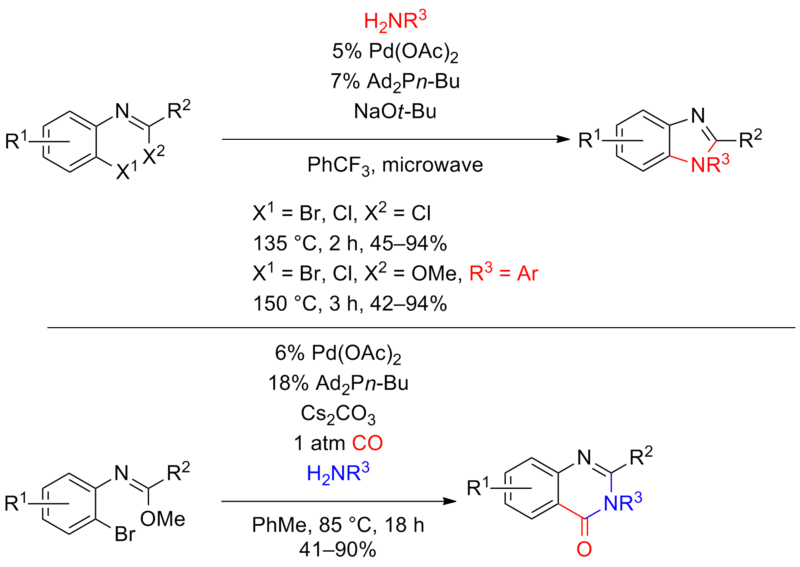 The chemists have also conceived a palladium-catalyzed quinazolinone synthesis with carboximidates having bromide on the ortho position of the benzene ring and amines as precursors. The reaction condition this time comprised a slightly higher precatalyst loading and a higher concentration of the ligand under 1 atm of carbon monoxide. Cesium carbonate and toluene replaced sodium tert-butoxide as the base and trifluorotoluene as the solvent respectively, and conventional heating substituted the microwave irradiation. The reaction mechanism now starts with palladium-catalyzed aminocarbonylation to create an amide intermediate that then undergoes cyclization under basic environment. This synthetic approach also allowed a variety of substituents even though incorporation of alkylamines needed a higher temperature. The carboximidoyl chlorides can be prepared from the commercially available corresponding anilines by synthesis of the amides with acyl chlorides and conversion of these amides to carboximidoyl chlorides by applying phosphorus pentachloride. (See the scheme below.) The carboximidates can be synthesized from the anilines and orthoesters with an acid catalyst or by heating. Palladium(II) acetate, cataCXium A, sodium tert-butoxide, and cesium carbonate are all in the market. Article: Sadig, J. E. R.; Foster, R.; Wakenhut, F.; Willis, M. C. J. Org. Chem. 2012, 77, 9473–9486. DOI: 10.1021/jo301805d.